Dennis: Hey how was your day? Jack: Pretty good. We’re going to Mommy’s class now. Dennis: Oh…what did you eat for dinner? Jack: (harsh whisper to me) What was that stuff called? Jack: It was pineapple fried rice. Dennis: So you like your pineapple cold? Jack: Yeah, the way it’s SUPPOSED to be. me: So you didn’t like my rice, eh? Jack: Ummm…I did, just not the HOT pineapple. me: Okay, no hot pineapple next time. Jack: You know I really think we said HOT pineapple enough tonight. Why do you go ahead and make dinners that start to take over my life? Previous postWould you call this spoiled? Okay, so that’s not my photo but mine did look like that! And leftovers were even better. Recipe soooo easy! Heat some oil in a pan…scramble an egg in it. 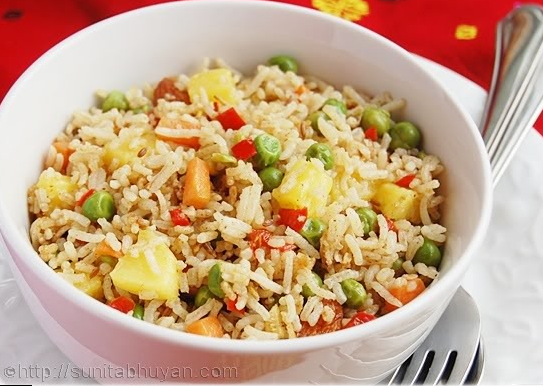 Then add diced onion, veggies that you like, I did the usual peas, carrots, corn and a tiny bit of red pepper…then add day old rice and stir it all up to get hot. Meanwhile add a little butter, a few dashes of soy for color, and then I add the Trader Joe’s brand Soyaki sauce which is really just ginger and garlic. Then at the last minute I added fresh cut up pineapple to warm it up. Yum!! I added grilled chicken to the leftovers tonight and it was still super good.